When Can Babies Have Honey? Since 2008, lots of changes have been made to the "rules" of when babies can have certain foods. 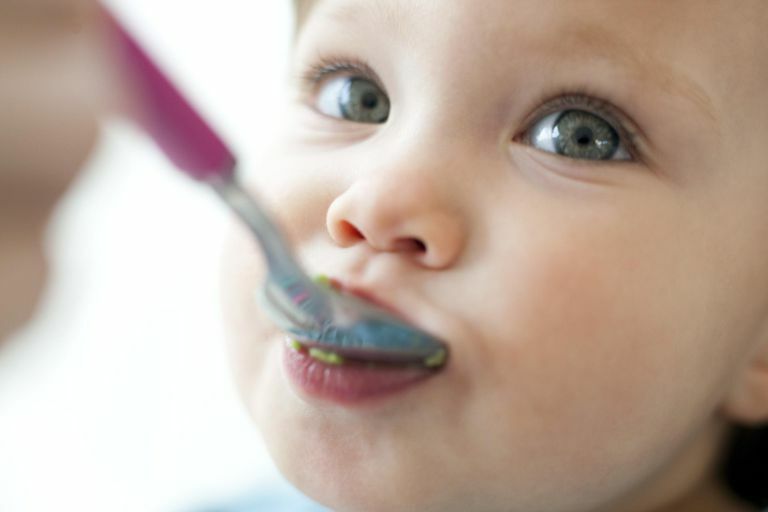 You might be surprised to know that many foods that used to be no-nos for babies until they were older now the American Academy of Pediatrics (AAP) say is fine for babies soon after they begin eating solid foods. However, that is not the case with honey or products made from honey. The recommendation for when babies can have honey continues to be after age one. That includes both honey in its raw form and other foods cooked or baked with honey. The AAP Pediatric Nutrition Handbook states, "Infants younger than 12 months should avoid all sources of honey." That statement makes it pretty clear that anything containing honey should be off limits, including those go-to honey cereals. The reason to delay honey is not because of a concern over food allergies or of choking hazards, but of a serious disease called infant botulism. Infant botulism is caused when a baby ingests spores from a bacterium called Clostridium botulinum. That bacterium then produces a toxin inside the baby's gestational tract. The toxin can have serious effects on the baby's muscle control. In extreme cases, which are rare, the breathing muscles can become paralyzed. If mechanical assistance is not provided, the baby could die. So maybe you are wondering why honey is not safe for babies under age 1 but fine for everyone else. The answer lies in the maturity of the baby's digestive tract. Young babies do not have the intensity of acids in the digestive system which helps fend off the toxins that the bacteria produce. So while adults and children can handle small amounts of exposure, it is not the case with babies. Baked goods made with honey are still off limits too. Even the high temperatures of cooking and baking will not destroy the botulism spores. For this reason, you shouldn't give your baby baked goods or cooked foods containing honey either. However, there are certainly those that would argue that these guidelines are overly cautious. They might point to the fact that other cultures outside the United States introduce honey to babies on a regular basis. Further, they might point out that the incidence for infant botulism from honey exposure is a very low risk. In the United States, fewer than 100 cases are reported yearly, and most of these infants recover fully after treatment. If you are considering introducing honey before your baby turns 1 year old, do be sure to talk with your pediatrician and listen to what they advise. But the statistics certainly do teach us that caution may be prudent. Before guidelines for preventing infant botulism were advocated, from 1976-1983 395 cases of infant botulism were reported to the Center for Disease Control. Most of those babies required hospitalization in order to recover, and sadly 11 of the babies died. Why risk something so serious, yet so preventable? Have your baby wait until after his first birthday to enjoy honey and foods containing honey. AAP Committee on Nutrition. Pediatric Nutrition Handbook. 6th edition. 2009. Ohio State University. "Botulism: What You Don't See or Smell Can Still Hurt You." 2011. When Can You Start Giving Your Baby Honey?